Sixteen-year-old Hannah is stung by a bee and experiences a severe allergic reaction. During the bee sting episode, Hannah loses her St. Christopher’s medallion, a gift from her boyfriend, Logan, who died a year before in a car crash. She has a near-death experience during which she hears Logan’s voice and feels his presence. He tells her to “go back” because her “work is not finished.” She is having a very difficult time coming to terms with Logan’s death. Hannah feels guilty that she didn’t do more to prevent what happened to him. She also blames Tom, Logan’s best friend, who insisted that they race their cars after they had been drinking. Hannah cannot forgive herself, and she definitely cannot forgive Tom. It is after the near-death experience that Hannah discovers that she can heal people, even animals, simply by touching them. The first one to benefit from Hannah’s gift is old Mrs. O’Connell’s ancient dog, Kitty, who starts to act like a puppy once she has touched Hannah. Mrs. O’ Connell recognizes Hannah’s amazing ability but has a hard time convincing Hannah that she now has a special gift. Hannah tells Mrs. O’Connell, “This isn’t a gift. 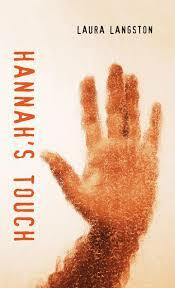 It’s a curse.” All her life Hannah has been different and now she feels like a freak. Marie, her closest friend, thinks Hannah should visit a pastor, and her parents think she should see a psychiatrist. Hannah keeps trying to find the St. Christopher’s medallion, and to understand what it is Logan wants her to do. No wonder Hannah is having nightmares! Unexpected events and Logan’s voice gradually reveal to Hannah what she must do. By using her healing powers for others will she also begin to heal herself?